Last March a band calling themselves MG&V played their first show to a capacity crowd at SXSW. The initials belonged to John McCauley of Deer Tick, Taylor Goldsmith of Dawes and Matt Vasquez of Delta Spirit. A record, they said, had been in the bag for several months and it was only a matter of time and tour schedules aligning before it would be out. Now as Middle Brother, the band spent the year carefully curating excitement for that release and as one of American Songwriter’s ten most anticipated albums of 2011, they have succeeded. Their self-titled record Middle Brother is out today on Partisan Records. It was well worth the wait. Since the collaboration was announced last year, Deer Tick, Dawes, and Delta Spirit have become three of the biggest up-and-comers around. Schedules packed with non-stop touring, strong LP and EP releases, festivals, and frequent stops at Daytrotter and at least one of the three bands are unlikely to have gone unnoticed (or unloved) by the attentive indie-Americana fan. The Middle Brother project is a great way for the musicians involved to continue to build momentum even as they shift their attentions momentarily away from their main projects. 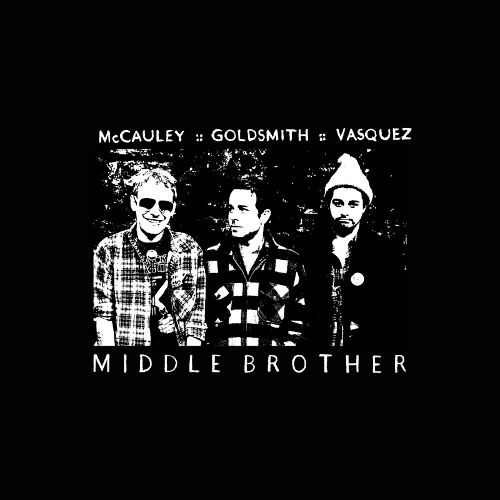 In fact, Middle Brother offers McCauley, Goldsmith, and Vasquez a unique opportunity to grow their support by introducing their respective fan-base to each other. It’s a brilliant promotional move, really: Delta Spirit fans who pick up the Middle Brother record for Vasquez’s contribution, will get a healthy dose of McCauley and Goldsmith and so on. It would be unfair, however, to judge the collaboration as mere calculated promotion. From the beginning it’s been clear that McCauley, Goldsmith and Vasquez have the purest of intentions. Their motivation revolves around friendship, love of each other’s work, and a sincere desire to share in the songwriting process. The record can be aptly summed up in those terms as well. Middle Brother is a cross-pollination – a bouquet – with the clearly recognizable writing styles of its members surfacing on each track, but with an undercurrent of comfortable collaboration. Vasquez infuses the record with a sense of urgent if soulful history. “Someday” and “Theater,” his two standout tracks, are reminiscent of golden-era radio doo-wop, but recast for an utterly modern post-radio moment. Goldsmith has three ballads on the record, four if you count the album’s closer “Million Dollar Bill,” where the lead vocal is passed around. Each is heart-wrenching, but none so much as “Blood and Guts,” a pre-Dawes resurrection that, with a little time to age and Jason Isbell’s nuanced lead guitar guest-work, is easily the record’s emotional apex. It’s McCauley’s work, however, that shines brightest here. From opener “Daydreaming” and the penultimate “Mom & Dad” to the record’s singles, the piano stomping “Me Me Me,” the rousing title track (which McCauley sings on but co-wrote with the others), the Deer Tick front-man’s voice is the sonic gel that gives the record its aesthetic continuity. Middle Brother’s debut doesn’t carry with it a promise of long-term, multi-album super group fame. Despite the temptation towards this allusion, Middle Brother isn’t this generation’s answer to Crosby, Stills & Nash. To take up those reins, McCauley, Goldsmith & Vasquez would have to sacrifice way more than they could gain. Instead, Middle Brother is a prediction of great things to come. It’s a promise that a new generation of songwriters is rising up to carry and brilliantly build on the tradition.